Click here for a sample of ANC038. If I were to talk of a history and the sounds of you, / then I would create a space with a bamboo chime / waving and making a flat sound not like / metal on metal but more like earth pounding on straw. As the Midwest was increasingly developed over the past century, a multitude of factors produced lasting consequences for the region's rich biodiversity. Agriculture has necessitated widespread habitat loss, industrial toxins continually spoil the environment, and invasive species have further decimated numerous ecosystems. What land remains diminishes with every push outward from the human population; city, suburb, exurb, expanding freely and forever. While it can be easier to lament the hazards faced by charismatic critters, it is kingdom plantae we have devastated most significantly. In Illinois alone, hundreds of grasses, sedges, ferns, weeds, and worts are currently listed as endangered or threatened. 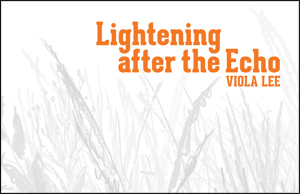 The free verse and prose poems in Viola Lee's Lightening after the Echo concern themselves, too, with the passage of time and the seemingly inconsequential items it so often glosses over. Lee documents her heritage, her role as a Chicagoan, and the small moments upon which her daily life pivots. The body and its shortcomings are featured throughout but greatly outweighed by Lee's attention to the sheer quantity of objects she is surrounded by: shampoo and frying pans, tofu and rice, scissors and staplers, boots and balloons, Shake 'n Bake and Bubble Yum, mixtapes and forks, plywood and glass, cake mix and coffins, blankets and bottles, envelopes and oranges, mirrors and ink. On and on and in the end, "you become all of it: the houses, the windows, and the ash." ANC038 is out of print.